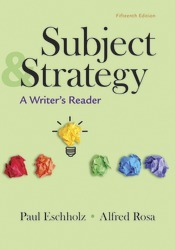 With engaging readings and proven writing instruction, Subject & Strategy guides students in selecting, practicing, and mastering writing strategies that will help them succeed in any discipline. Example-driven instruction models writing strategies in action, and innovative classroom exercises and writing assignments help students identify strategies in the readings and put them into practice. Students are encouraged to see themselves as writers, and comprehensive, accessible coverage of reading and writing, research, documentation, and grammar provides a foundation for success.